Sterling silver round shadowbox baby bracelet with one free form turquoise stone and twist wire down the center. Shadowbox piece measures approximately 9/16" in diameter and bracelet tapers down. 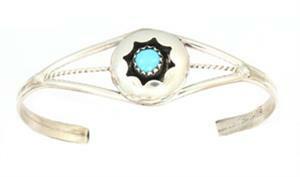 Wrist size meaures approximately 4'' with an opening of 1'' Handcrafted by Navajo artisan Esther White.